Newsroom Home News Stream Did You Know? 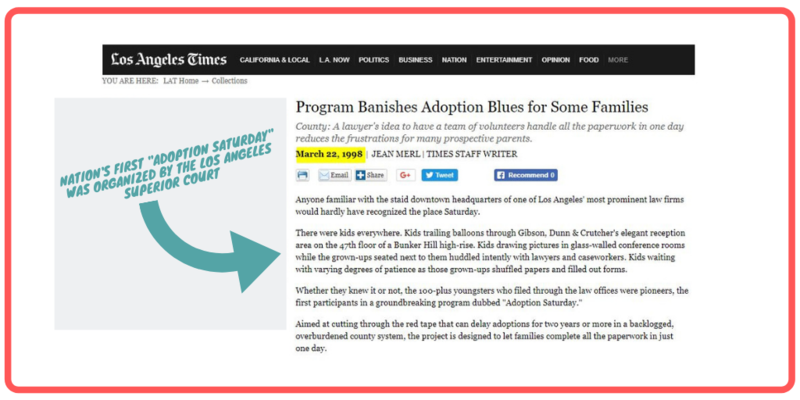 Los Angeles County created the nation's first Adoption Saturday in 1997. On a Saturday morning more than 20 years ago, Los Angeles County judges, court staff, and volunteers welcomed attorneys and (prospective) parents to the Edmund D. Edelman Children's Court. They all shared one common goal—to process adoptions for foster kids stuck in the backlog of cases. By clearing the backlog, the court created forever families for children living in foster care in Los Angeles County, and created a national model for performing adoptions. This Saturday, 400 U.S. cities will celebrate National Adoption Day, finalizing approximately 5,000 adoptions. Courthouses will be filled with balloons, stuffed animals, and most importantly, new families. The annual event is traditionally celebrated the Saturday before Thanksgiving, though some counties host several of these events throughout the year. For a listing of events nationwide, visit nationaladoptionday.org/events/.